Resources WG Update PRAGMA 9 Hyderabad. 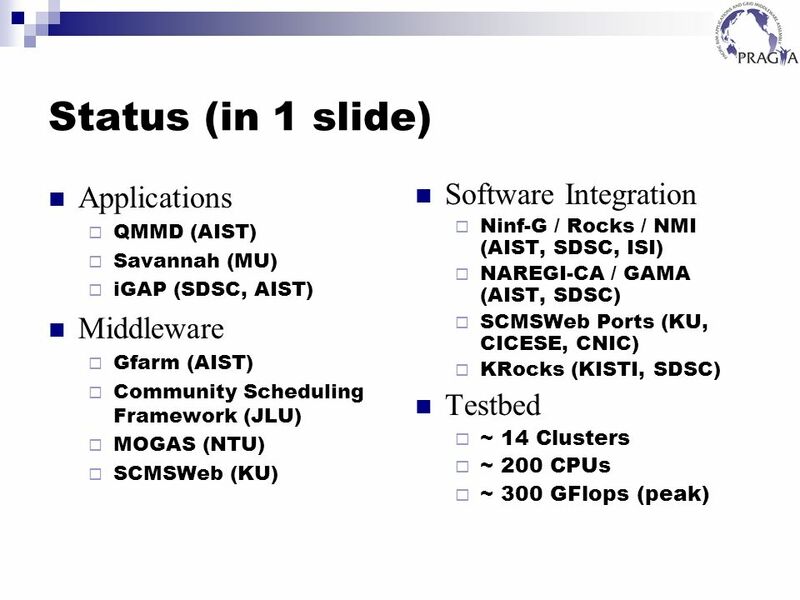 Status (in 1 slide) Applications QMMD (AIST) Savannah (MU) iGAP (SDSC, AIST) Middleware Gfarm (AIST) Community. 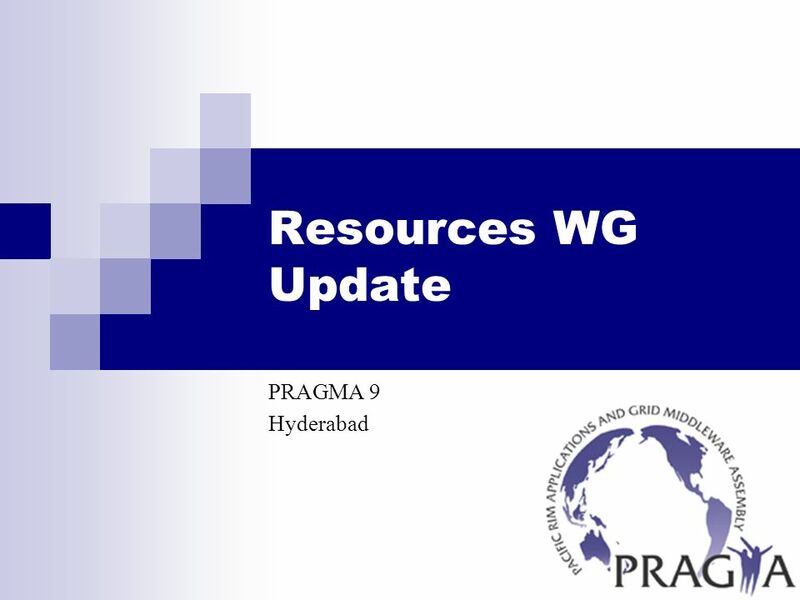 Download ppt "Resources WG Update PRAGMA 9 Hyderabad. Status (in 1 slide) Applications QMMD (AIST) Savannah (MU) iGAP (SDSC, AIST) Middleware Gfarm (AIST) Community." PRAGMA – TeraGrid – AIST Interoperation Testing Philip Papadopoulos. Resource WG Breakout. Agenda How we will support/develop data grid testbed and possible applications (1 st day) –Introduction of Gfarm (Osamu) –Introduction. OSG All Hands, 3/5/2007 Cindy Zheng Peter Arzberger Philip Papadopoulos Mason Katz P acific R im A pplication and G rid M iddleware A ssembly University. National Institute of Advanced Industrial Science and Technology Experiences through Grid Challenge Event Yoshio Tanaka. Multi-organisation Grid Accounting System (MOGAS): PRAGMA deployment update A/Prof. Bu-Sung Lee, Francis School of Computer Engineering, Nanyang Technological. PRAGMA 17 (10/29/2009) Resources Group Pacific Rim Application and Grid Middleware Assembly Resources. Reports from Resource Breakout PRAGMA 16 KISTI, Korea. Resources WG Update PRAGMA 10. Interoperability PRAGMA TG (ANL) Moving onto EGEE GGF GIN group Trust Enabled by APGrid PMA. Resources WG Report Back. Account Creation Complaint –Too difficult to obtain user account on all resources Observations –Just ask Cindy and she will. 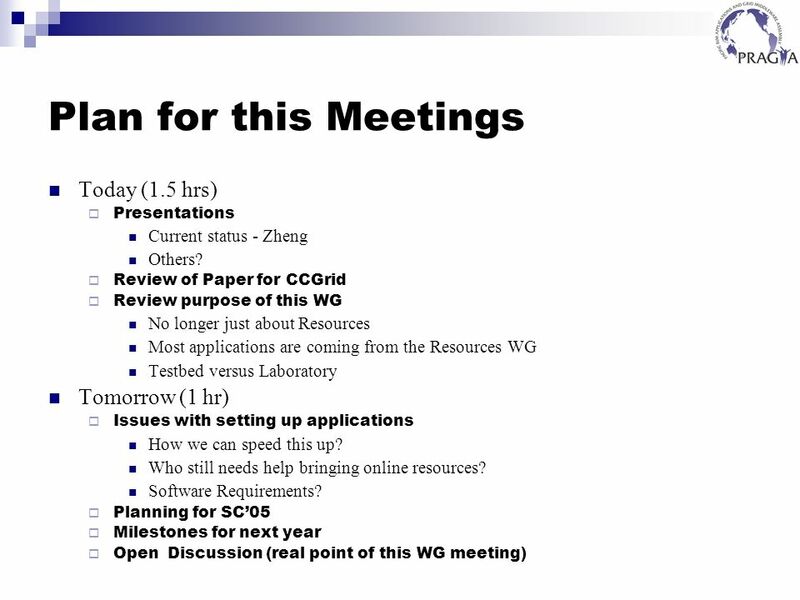 Resource WG Update PRAGMA 14 Mason Katz, Yoshio Tanaka, Cindy Zheng. Resource WG Update PRAGMA 8 Singapore. Routine Use - Users make a system work. Biosciences Working Group Update Wilfred W. Li, Ph.D., UCSD, USA Habibah Wahab, Ph.D., USM, Malaysia Hosted by IOIT Hanoi, Vietnam, Oct 29, 2009. Steering Committee Meeting Summary PRAGMA 18 4 March 2010. Reports from Resource Breakout PRAGMA 15 USM, Malaysia. Investment for the Future of PRAGMA Progress Since PRAGMA 10: PRAGMA 11 Osaka University 15 – 17 October 2006. PRAGMA 15 (10/24/2008) Resources Group Pacific Rim Application and Grid Middleware Assembly Resources. National Institute of Advanced Industrial Science and Technology Status report on the large-scale long-run simulation on the grid - Hybrid QM/MD simulation. Progress Since PRAGMA 19 Planning for PRAGMA’s Future PRAGMA 20 2-4 March2011 University of Hong Kong.